Anif is a village with approximately 4000 residents just south of the city of Salzburg. Effectively, Anif is a suburb of Salzburg - and a legendarily wealthy one. Do some digital sightseeing via Google maps or other providers of satellite or aerial views and you will see that almost every other house in Anif has a swimming pool. Politically, Anif is part of the Flachgau area. It used to be part of nearby Grödig and was separated as an independent municipality only in 1895. However, the village as such is rather ancient - the name is probably derived from Illyrian languages, indicating a continuous settlement for millennia. Anif has relatively many sightseeing attractions to offer (at least for a village) and like most municipalities just around Salzburg, it has several high-end hotels. International visitors might get excited about the Wasserschloss Anif or Anif castle, which famously featured as the villa of the Trapp family in "The Sound of Music". 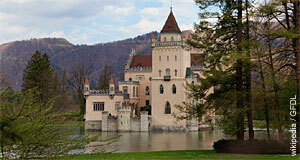 It looks much like a Disney-fantasy castle, but in fact, its core is properly Medieval. The castle once served the Bishops of Chiemsee (who were subordinates to the Archbishop of Salzburg) as their summer retreat. In the 19th century, the castle was fundamentally altered into the strange romantic water castle that was then used in "The Sound of Music". Other attractions of Anif include the ancient parish church in Romanesque style and the cemetery, where the tomb of Herbert von Karajan can be found. The famous Austrian conductor lived in Anif for many years, even before it became the luxury suburb it is now. Note also that functionally, the palace of Hellbrunn with its extensive parks and the Monatsschlössl as well as the Salzburg Zoo are closer to Anif than the actual city of Salzburg.